1 Combine all ingredients except chicken in medium bowl. Reserve 1/3 cup mayonnaise mixture. 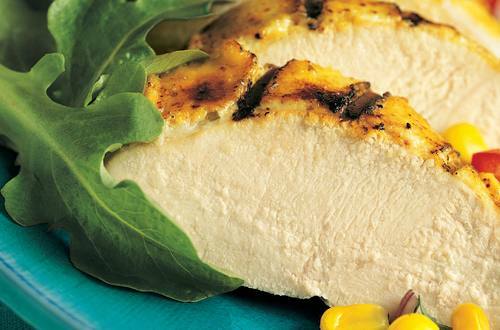 2 Grill or broil chicken, brushing frequently with remaining mayonnaise mixture, until chicken is thoroughly cooked, turning once. Serve chicken with reserved mayonnaise mixture and garnish, if desired, with additional chopped green onions. VARIATIONS:   For Grilled Lemon-Pepper Chicken...combine 1 cup Mayonnaise, 1 tablespoon lemon pepper and 1 tablespoon dried basil leaves; reserve 1/2 cup and prepare as above. For Grilled Caesar Chicken...combine 1 cup Mayonnaise, 1/4 cup grated Parmesan cheese, 1 teaspoon chopped garlic and 1 teaspoon Worcestershire sauce; reserve 1/2 cup and prepare as above. For Salsa-Dipped Grilled Chicken...combine 1/2 cup Mayonnaise and 1/2 cup prepared salsa; reserve 1/2 cup and prepare as above. For Grilled Asian Chicken Salad...combine 1 cup Mayonnaise, 1 tablespoon soy sauce, 1 tablespoon honey, 1 teaspoon ground ginger and 1 teaspoon chopped garlic; reserve 1/2 cup, prepare as above and serve over salad greens.